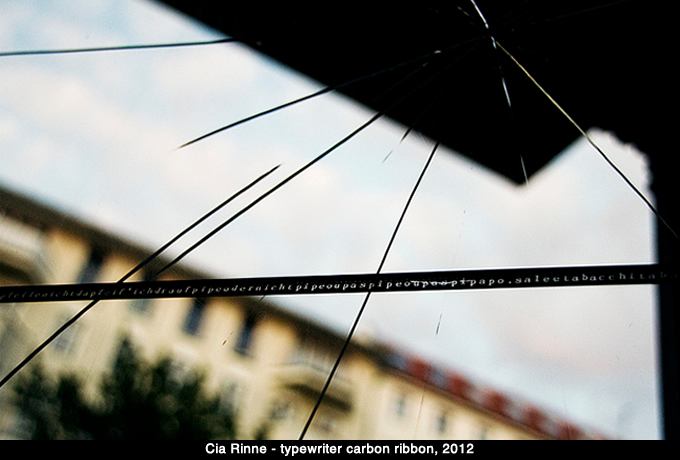 Cia Rinne (1973, Gothenburg) is a writer, poet and artist with an uncommon natural inclination towards languages. Born in Sweden from a Finnish family and raised in Germany, she holds a MA degree in Philosophy and has studied in Frankfurt/Main, Athens and Helsinki. Experiencing the continued switch between many languages and places helped her to raise awareness about the political and cultural implications lying down subtle gaps and shift of meanings. For her first book zaroum (Helsinki, 2001) Cia typewrote all the multilingual texts, intertwined with graphic elements like boxes, drawings, witty and ironic multiple-choice questions, conveying her interest in visual composition and crossing languages and genres. A publication with manifold visual and conceptual influences that ranges from Fluxus and Dada short compositions to Wittgensteinian language-games. Some years later the publication developed into the web-based project Archives Zaroum (2008), hosted by the Danish Platform Afsnit P and designed by Christian Yde Frostholm. Her second collection of poems Notes for soloists (OEI Editör, 2009) is marked by a more aural way of dealing with language. Working for seven years on the final publication, this acoustic feature has led her to experiment with the performativity of the text both in readings and collaborations with artists and sound designers. The partnership with Sebastian Eskildsen, sound designer at the Copenhagen Royal Theatre, gave birth to the sound work Sounds for soloists (2011-12). 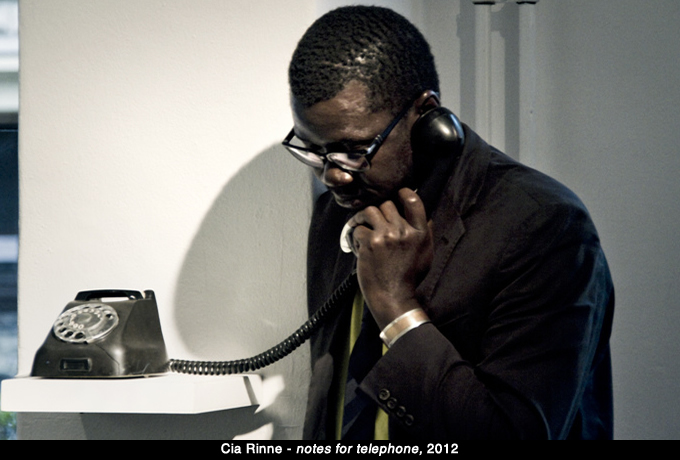 Besides her poetry projects, Cia Rinne is committed since the end of the 1990s to deepening her study of communities, which, due to climatic, economic, and racist issues have difficulty in gaining respect and consideration in the eyes of the citizens. 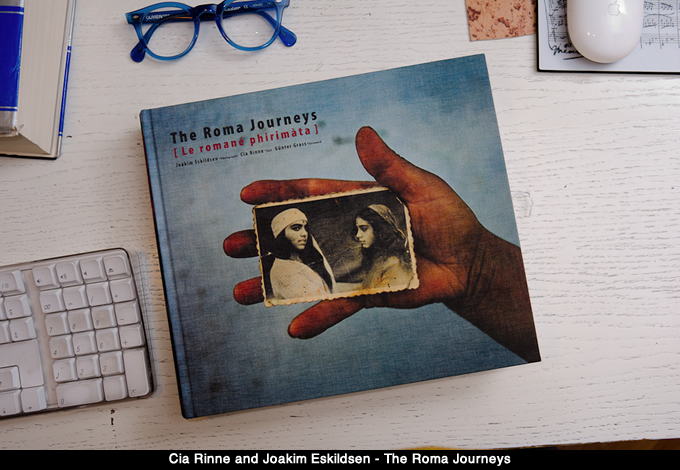 In collaboration with the photographer Joakim Eskildsen she undertook long journeys in Portugal, South Africa and throughout Eastern Europe that have led respectively to Blutide (Opus 33, Helsinki, 1997), iChickenMoon (Opus 38, Helsinki 1999) and The Roma Journeys (Steidl, Göttingen 2007-2009). 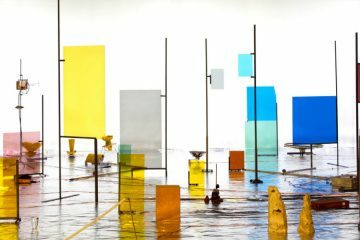 Recently she took part in exhibitions including Terra Infirma (2010) at the ISCP New York, and the Turku Biennial (2011). I met her in Berlin on the occasion of her first solo show Sounds for soloists in the town where she lives. 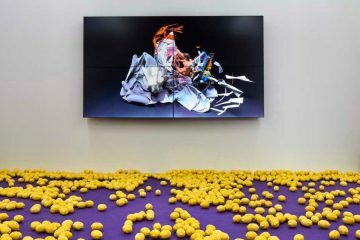 The exhibition curated by Solvej Helweg Ovesen in Grimmuseum shows the artist’s endeavour to deal with space, sound installations and live performances. Together with her previous production, she presents new poems, serious cerises, from which unfold the sound installations sans y/eux and notes for telephone, designed by Cia Rinne and Giovanni Conti. Grimmuseum also hosts readings by Cia Rinne and sound performances in collaboration with Frisk Frugt (Fresh Fruit), behind which is the Danish musician Anders Lauge Meldgaard, and Tomomi Adachi, Japanese performer, composer, artist, and recipient of the 2012 DAAD Residency in Berlin. 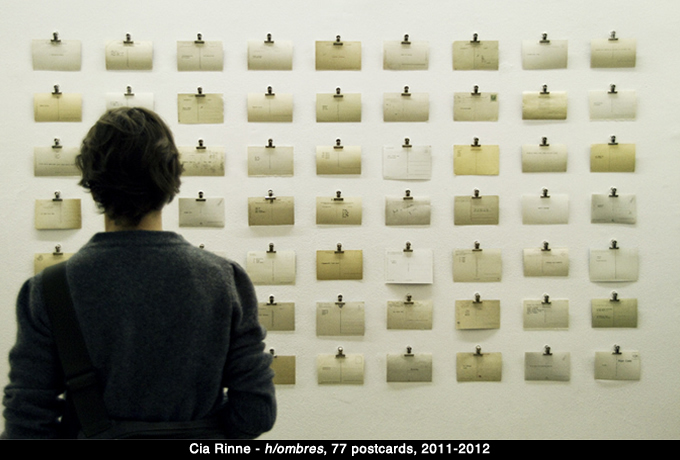 The influence of the journeys comes up in Rinne’s installation piece indices (2012) related to the Roma project, which makes reference to Paul Celan’s poems and shows the relevance of the archive in her artistic and research practices as it was during the time she spent with the the Roma communities in seven different countries. Mario Margani: Both in poems and installation pieces you adopt the structure of the archive. This affects the minimal sharpness in the use of space, words and sounds and seems to play a prominent role in managing all the materials and texts you are collecting. Is it a systematic method to deal with your journey experiences as well as with the conception of your works from the very beginning? 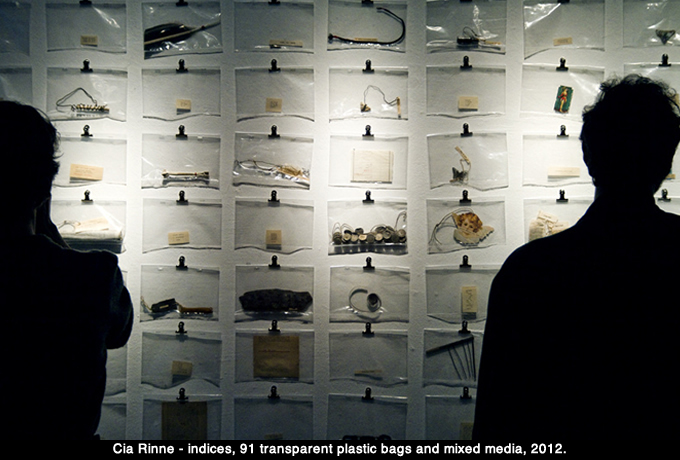 Cia Rinne: Yes, it’s a way to arrange the material, and it’s not like cataloguing. I like the archive itself as an idea that can contemplate everything, a sort of form in which everything can be included. When I start to work and I have all these objects, I need to understand how to give them all one shape, because they are all singular objects and as I start to archive I get new ideas, which help me to develop the project. I love also the allure of the original idea of the archive. For this reason archives zaroum, which is a web-based project, looks like a ‘totem’: real objects and old paper allow the user to imagine it as a real work, although it is only on the web. Mario Margani: A similar strategy in the work indices unfolds your relation with objects. The visitor can navigate through a collection of objects and words in plastic bags hanging on the wall. They are related to your Roma Journeys, reminding us of the memory of deportation of Roma population, thank to the quotes from Paul Celan’s poem Todesfuge (Death Fugue), who was in turn using the language to penetrate the horror of the extermination camps. Each column refers to a different object or story, although it starts and ends with a key. Were you collecting object from the beginning with the purpose of this work or is it also a part of your practice? Cia Rinne: For many years, I used to collect rusty objects; it was a sort of passion. And then, travelling to different places during the Roma journeys, I was collecting all kind of objects, and that became an obsession, too. Then when I was asked to do an exhibition for an artist residency in Romania, I started to combine some of these found objects and I also started to add text, so that a second level of understanding came up. For example, just a small selection of all these objects is on show now, but it always keeps the shape of the two keys. Then there are different themes and colours; you can find for example hair, black milk, or other objects referring to the Holocaust: I somehow wanted to give the fate of the Roma people the space that the fate of the Jewish population already has to some extent. There are Fluxus-oriented objects, too, but also some very severe fragments that refer to what happened to the Roma, and there is a disturbing lack of knowledge on this in many countries. It has occupied me for a long time. Mario Margani: With reference to the diversity of your projects – books, online works, installation and sound pieces – you have already stated that your first project, i.e. zaroum, keeps working more like a platform on which you can move also now that you are developing further projects. Nevertheless, the visual features of zaroum on the contrary are rather far away with respect to the aural nature of Notes for soloists and your other recent developments. Why did you start with this kind of approach recalling visual poetry? Cia Rinne: I think it’s very strange how what I did come up with this. I always used to play little word-games at school while writing or listening to something. Then it became more severe when I was studying philosophy and so much dealt with the language. We were disputing about every single word, and the resulting language often turned out to sound ridiculous. In order to say something really clearly you have to simplify the language, so as to avoid any possibility of misunderstanding. Many discussions were structured upon which word to use. Philosophical language is often a very peculiar language. Wittgenstein wrote: “A proposition is completely logically analysed if its grammar is made completely clear: no matter what idiom it may be written or expressed in.” Somehow this way of thinking affected me. You immediately react logically to something that could be misunderstood and you have to use the language in a minimal expression to have control over it. The minimal pieces in zaroum were partly an attempt to give certain thoughts a shape, to make them more intelligible, and examine them in a different way. For this, I used simple drawings and figures, too, hence the visual elements in the first book. For example, with the drawn boxes in zaroum, the interesting thing is that you have a very limited space. I started drawing these boxes for example on journeys, and when I put something inside – a drawing or few words – always something interesting happened, like an automatism. The shape of the box is like a classic in works at the border of visual arts and poetry; Vito Acconci used it in his writings, for example. I am not a good drawer, so I tried to keep them really simple and the figures I use are not elaborate, mainly geometric elements. They can symbolize a lot of things, but they present themselves for what they are: a line, a square and a circle. The possibility of the meaning is inside. Mario Margani: This process becomes really clear in the web-based Archives Zaroum, which shows how the meaning could be already inside each minimal intervention also with the help of the animation. Are you also thinking about developing other web-based projects? Cia Rinne: Not at the moment. It might be nice to have a more general web archive. In the case of the archives zaroum, Christian Yde Frostholm asked me to collaborate and to build this web archive for the Danish visual poetry website http://afsnitp.dk. I would have had no idea of how to do it myself. Mario Margani: Do you think this development had an influence on other works, or is it more one point where the project ended up, but not the main goal? 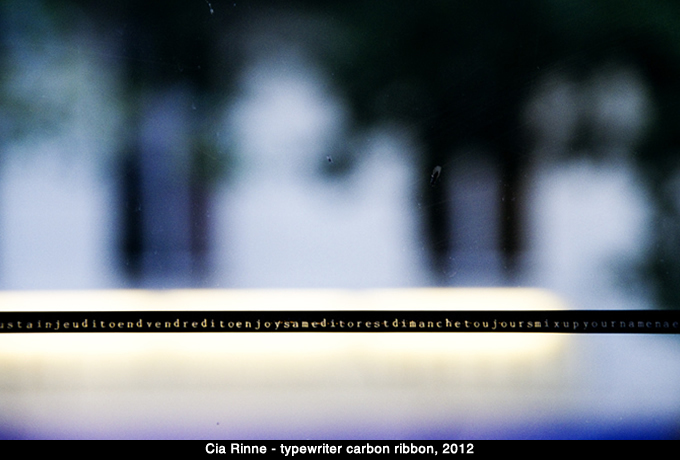 Cia Rinne: Yes, it was nice to explore the pieces and how they can move and live alone. But I think a further development could be to make a film where you can see them all in a shared space, because I actually prefer to have a shared and common experience of my work, a real contact with the audience, which can of course be in the book, too. 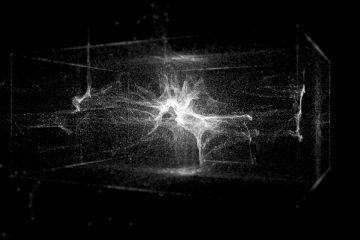 Often people are alone in front of the computer and I’m really trying to keep this web-orientation away as much as possible from my works. Mario Margani: In the exhibition you are also showing the carbon ribbon of the electric typewriter you adopted to type all your texts on paper instead of using digital printings. It seems a reaction to the digital invasion, trying to stick to the moment of the reading and of the physical production of texts and sounds. Could we speak about a post-digital influence in your works, whose experience is always intertwined with your voice and your presence during your readings? Cia Rinne: Yes, definitely. I also see this like a kind of development. The typewriter I used for the first works produces a certain aesthetic, and also leaves physical traces on the paper. It produces a lot of shades though, so that I had to clean it for the making of zaroum, and in order to have a more clear and clean font, I reduced the size of the words, too. Now, I was looking for another way to produce these works, so using an electric typewriter was a natural development. 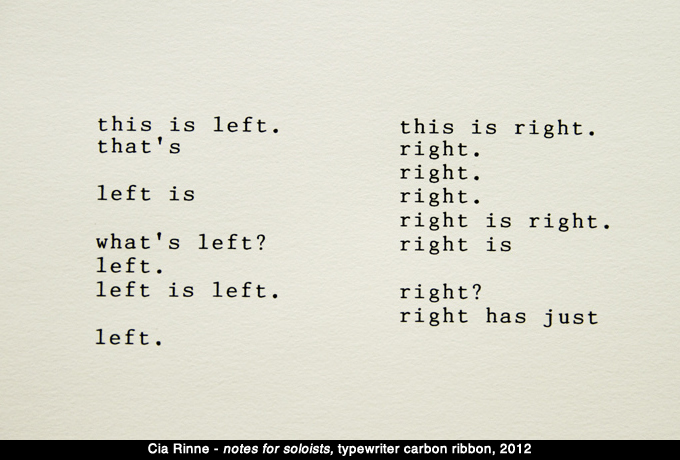 For notes for soloists, I used a typewriter font. The book is also visual, but doesn’t have any drawings, so somehow it didn’t fit to use a real typewriter, and it was not what I wanted to achieve. On the other hand typewriting works better on the wall: it’s good to have ink on paper, but it’s not as sharp as the electric typewriter. The carbon ribbon is quite amazing and I didn’t know about it. You cannot produce it again and in any other way. All these fonts that I used will always be on this strip, and for the same reason, I love to use the old rotary telephone reminding me of a time where the attitudes and the relations between the objects and people were not so abstract as today. Also, listening to somebody performing is always about physical experiences. Now that everything is theoretically available and that you can find all on the Internet, it’s important to still have the chance to live some unrepeatable moments. Mario Margani: Despite this, you work also with sound installation based on your poems. sounds for soloists and sans y/eux where you are present with your body, but only with your voice. When you try to deal with your absence in your works, it comes not so easy and natural to you. Was this the very first time? Cia Rinne: Yes, was the first time and sans y/eux is also a completely new work, thanks to Giovanni Conti, who realized the sound installation. For long time I had this idea of a hanging installation to get into the sound and be surrounded by it, but I imagined it more like a messy work with a lot of loudspeakers hanging from the ceiling. Now, in Grimmuseum it turned actually to a space where the visitor can enter a circle of sound, and it’s up to the visitor to get close to one of the speakers, or to stay in the middle, listening to all of them. I do not feel it is a bad thing to be physically absent from my voice as it were, on the contrary, I think the work itself is what is important, not the artist. So, having a private reading such as in the Notes for telephone is another way of keeping yourself out of the work, and like with reading a book, giving the spectator the possibility to be alone with the text. Mario Margani: Did the shape of the sound installation – the circle – come up because you were adapting your ideas to the exhibition space or is it also related to some of your previous experiences during your journeys? Cia Rinne: I was more focusing on the sound and on the idea of being surrounded by it. You usually have two, four or eight loudspeakers, because of the eight channels, but I wanted to use seven speakers as many of my pieces have seven lines, or six plus one. The number seven keeps reappearing in my works and I think also because it confers a really interesting rhythm in the pieces. In this way people do have to get inside the circle through a sort of entrance that breaks the regular position of the speakers. These make sense also in the use of spaces. People I recorded during journeys usually sat in a half circle around me. I have been bearing this idea of a circular sound installation in mind for a long time, and now, suddenly, it is realized. Mario Margani: In live performances in collaboration with other sound artists, are they working on your compositions and texts and then producing music and effects, as it happens in Sounds for soloists, realized in collaboration with the Danish musician and sound designer of the Copenhagen Royal Theatre, Sebastian Eskildsen? Cia Rinne: For the sound piece Sounds for soloists, Sebastian Eskildsen recorded my reading of the book notes for soloists, analyzed each piece, and then produced small compositions for each of them, composing music for the sound piece, too. It took obviously a long time. The current version has a length of 18:20 minutes. We have been asked to perform it at Louisiana Literature in August, which will be the first time we perform it live. Usually, I prefer not to perform live with musicians, mainly, because my pieces are simply too short, and each having a different rhythm, they are quite impossible for a musician to catch up with, and simply not fit for improvisation. So when performing with two musicians in Copenhagen, we chose the longer pieces so that they could actually get into the rhythm. 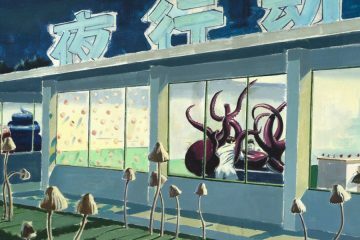 Mario Margani: Which kind of collaboration have you established with Tomomi Adachi for the performance in Grimmuseum? 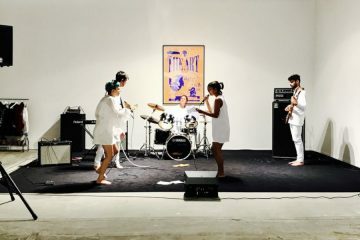 Cia Rinne: Tomomi has invited Alessandro Bosetti, Jennifer Walshe and me to collaborate on a performance on the Japanese avant-garde movement MAVO that he does in the frame of his DAAD residency in Berlin. It will be performed in September, and we have been working on some MAVO poems, homophonic translations, and pure ones, using Romanian, Finnish, and Japanese. Also, we have worked on a performance of notes for two soloists, in which Tomomi performs certain written and unwritten parts of the notes for soloists, and we read them together. Mario Margani: In your poems, one of the main features seems to be the repetition of the same sound or word in different languages with some little variations, which imply surprising meaning shifts. Derrida, Deleuze, and Guattari – among others – analysed these iterations in depth. Considering your philosophical education, could we also reckon your works as a kind of philosophic statements? Cia Rinne: My writings are influenced by philosophy as well as by other things, but they probably reflect more on statements than pursuing a certain idea. A piece usually begins with a thought or a quote and then I try to reduce it to its essence, or develop it further, often using repetition, too. Many pieces are shaped from this interest not in explaining but in reducing words and sounds to a form. Then there are some sentences that just stick with me, such as “nicht zu perfekt, liebe gott böse” by Nam June Paik, fragments of language that have been in my mind for such a long time that I feel I have to work with them. That happened with the Karlheinz Stockhausen piece, the introduction he was regularly giving before some concerts, too; it has a really nice rhythm: “I was told as a child and a boy that the French were our enemies and the English were our enemies and the Italians were our friends and the Spanish were the friends and the Japanese were the friends and the Russians were the friends (but that changed a year later; then the Russians were enemies as well). And the Finnish were friends, etc. I did not know what to do with this.” I was fascinated by its rhythm and simplicity, and it’s also such a funny way to explain, certainly exactly the way the child was taught to understand the world, but very often this kind of intelligibility and sharpness is the most difficult to achieve. Although there are many nonsense pieces that play with mere language and sound in my work, I do try to keep some sort of meaning in the pieces as well. Mario Margani: Your projects are also related with travelling and living for a period in different communities. When did you start collaborating with the Danish photographer Joakim Eskildsen? Cia Rinne: In 1995 we had the first journey to the north of Portugal to make a documentary project about a fishing village, Apúlia, which due to erosion was almost falling into the sea. Blutide was our first common project; I wrote texts in English and Portuguese for the book. Then we continued to South Africa, where Joakim was asked to teach after the official end of the Apartheid Era. This was interesting because many white people in South Africa somehow assumed they did not have to deal with the country’s recent past, but the different populations still lived completely separated lives and hardly had any interactions with black, coloured or Indian people of it was no for service or business. Coming from the Europe, the simultaneity of the different worlds, and the way to willingly keep them separate at first seemed foreign to me. We wanted to get to know the black population, so we began staying in a township with a family, and then ended up in the countryside. The result was the book iChickenMoon. That project was also a helpful hint for re-evaluating the situation in Europe that we had to face during the following project. When we returned, we soon realized that Europe has its own Apartheid, just less visible, that is keeping a huge part of the Roma population outside society. We started distinguishing between the ‘visible’ and the ‘invisible’ Roma. There are on the one hand the ‘visible Roma’, a small part of who give us the perception of a population living in the streets as beggars, selling roses or playing music, people who have been coming to bigger cities in Western and Eastern Europe, because they lost their jobs immediately after the revolution in Romania for instance, and have been refused employment since. On the other hand, there are also the ‘invisibles’, living like anybody else, but you could not tell they are Roma. It’s like an invisible part of Europe as well. When I learned about thermo in one country, I got more and more curious to find out more, and the discrepancy between the general ignorance on this topic and the alarming situation was baffling to me; it was a really involving project. Mario Margani: The influence of travelling is also recognizable in your works. On one hand, as long as we remain in the philosophic field, we could also talk about ‘travelling of meanings’ in relation to the iterations of words. But there’s also the more factual influence of the physical travel. The two wall installations seem to be deeply related to displacement: indices with the collection of objects related to the Roma project and h/ombres postcards related to private journeys and modified with the use of the typewriter. Does the language play a leading role in your relation with different communities and places? Cia Rinne: Yes, and there are originally three reasons. I grew up with Finnish parents in Sweden, and then we moved quite early to Germany, where our neighbours, who came to become like my second family, were Italians. So I always had a consciousness about different places and actually I don’t like to be stuck in one place. It’s very strange and difficult for me to feel at home, maybe I feel more at ease where there are people coming from many different places like there are in Berlin. I like to go to different places, but I think I sometimes need to return to one of those places that I love and feel close to, but where I haven’t necessarily grown up. I guess Finland, Italy and Berlin are such places to me. I always miss some of their elements, and I feel I have to re-join them for a period in order to feel complete. Concerning the languages, it is not that I absolutely wanted to learn all of them, it came out of necessity to talk with the people, such as with Roma in different countries, and I have always wanted not to be difficult for the other side making everybody else speaking English because I don’t speak their language. I find it really important to understand the people, and it’s not only about verbal communication, but also about the way people move, the relation between body and space changes a lot depending on the language you speak. Mario Margani: So after a while the language affects also your own attitude and you experience yourself changing and adapting to it. Cia Rinne: When you have to live and stay with people for some time, at the beginning it’s like a shock and it takes a lot of time but after a while you let yourself completely into it and you start eating what they are eating, you move like them, you speak like them – or at least you try – and it’s easier to get into. If you always try to keep your own sphere of habits it is rather difficult to stay in such a different environment for three months. This is at least what I experienced and felt on journeys. 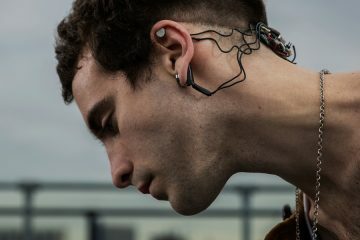 On the contrary in the performances and in my pieces I don’t want to connect to such a feeling. I try to use more abstract languages, languages that for me are not related to any places or atmospheres in particular: English, French and German. I try to catch universal feelings, so I try to keep it the more accessible as possible. It’s also easier to switch from one of these languages to the other and it does not come very easily with Finnish or Swedish, almost never happens. Also when I’m performing my pieces for example in Iceland or Sweden, where the exhibition is going to travel in the next months, I keep using the same languages, not adapting them to the country where I am. Mario Margani: You have already experienced different forms of communities, which relate in many different ways to space, tradition, and culture. They are all in different ways communities crossing or unfitting with the notion of nationality or state. With your multilingual pieces and your projects are you also trying to communicate different possibilities about the concept of community? Cia Rinne: I think it comes more unconsciously. 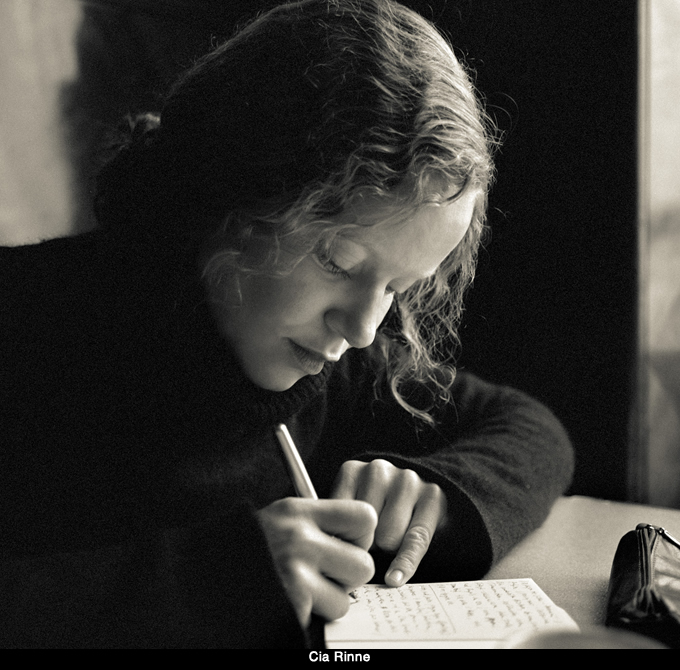 I do write the pieces in the way they appear, and usually, it will only work in this one language, being untranslatable into others. Which language I use has never been so central to me, and I do not wish to get into the limitations of using just one language in a work that hope to keep quite free. On a very personal level, all the different languages make me feel more human in a way, they give me the chance to combine memories with places and people and I’m able to collect experiences thanks to the languages. Mario Margani: In your pieces of poetry you started with a more visual book, zaroum, but then with notes for soloists you moved to a more aural direction. Now that you are working on your next collection of poems, has one of this two different approach aftermaths on your production? Cia Rinne: It`s mostly a development. And the pieces from the Serious cerises series, those surrounding the hanging sound installation sans y/eux in the exhibition space, are already part of the next collection of poems. Some of them are more concerning political themes, next to pieces related to books and love, for instance. I have already given readings of this new text and I think that from the point of view of the sound it’s a continuation of Notes for soloists. Maybe it becomes a little more political and personal at the same time. notes for soloists is very abstract and minimal. I guess I should be more political, not in terms of statements, but more concerning the influence on my new pieces. It is such a luxury to work with experimental poetry, something that can seem utterly senseless in relation to the state of the world. During the past years, the journeys I do have altered a lot, I no longer stay with people over extended periods of time, but mostly travel for readings or exhibitions, so I no longer live with people who live in poor conditions, but I do not want to forget what I saw.